Entrance to the Khoord Caubul Pass from Bhootkah. bl.uk > Online Gallery Home	> Online exhibitions	> Asia, Pacific and Africa Collections	> Entrance to the Khoord Caubul Pass from Bhootkah. 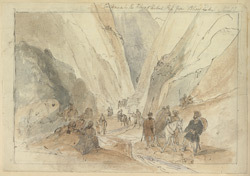 Pen-and-ink and water-colour drawing of soldiers in a rocky mountain pass in Afghanistan by James Atkinson (1780 – 1852) dated 1840. Inscribed on the front is: 'Entrance to the Khoord Caubul Pass from Bhootkah.' This is one of a series of sketches from an album of views in Afghanistan from the Khyber Pass to Kabul, intended to be a sequel to ‘Sketches in Afghaunistan’ by the same artist. In the 19th century the British, eager to defend their Indian Empire from Russian territorial ambitions, were involved in campaigns in Afghanistan and the North West Frontier Province (Pakistan). Atkinson served as Superintending Surgeon to the Army of the Indus, a combined force of British and Indian troops that marched on Kabul during the First Anglo-Afghan War (1839-42). Along the way he completed many sketches portraying the military skirmishes of the campaign as well as landscape views and the lives of local people.